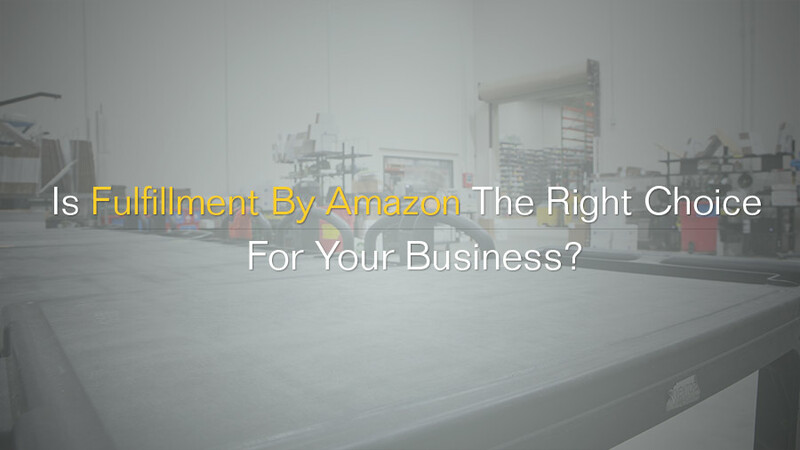 Home › Label Learning Center › Label Guidelines › Is Fulfillment By Amazon Right For Your Business? It's easy for anyone to get started selling their products on Amazon. If you're a professional seller on Amazon, chances are you've already thought about using their fulfillment service. Sellers who utilize Fulfillment by Amazon (FBA) ship their products to one of Amazon's warehouses. Amazon then sends your products directly to your customers upon receiving an order. There are several reasons why you would want to take advantage of this service if you are a seller. Luckily, we're here to help you decide if it's right for you and provide FBA labels perfect for labeling products and shipments if you decide it is! FBA is a useful resource for small businesses looking to optimize their shipping process. Orders will always ship on time and you no longer have to worry about making those tedious post office trips on your lunch break. They also offer an easy-to-use management system so you can keep track of your shipments, orders, and inventory with Amazon. OnlineLabels: How many products are you shipping daily? Steve: If you found some old college textbooks or movies you haven't watched in years and just want to get rid of them, FBA probably isn't the best choice for you. Every business is different, but we found that after 50-70 orders a day, it made sense to outsource our order fulfillment to Amazon. "...We found that after 50-70 orders a day, it made sense to outsource our order fulfillment to Amazon." OL: Are you able to make customer satisfaction a top priority? S: If you're finding it challenging to deal with customer service issues while also packing orders and managing inventory, FBA handles customer service inquiries 24/7. It's a useful service to take advantage of if you don't have the time to answer questions immediately or aren't skilled with handling complaints. Plus, customers love the free two-day shipping via Prime! OL: Will it be worth it? S: FBA takes a cut of your total sales. If you don't bring in a high amount in terms of revenue, it may not be worth using their service. Costs can be steep, as they depend on factors such as product weight, storage costs, and strict labeling requirements. Amazon also offers to print labels for you for a fee. Those costs can really add up. After looking at how much we would be spending on each shipment, we decided it made much more sense to print our own FBA labels. Once sales started picking up, we decided to test the waters to see how FBA could further improve our business. Three months later, we were only shipping through Amazon. It's opened up our product line to an international market and we've seen a drastic improvement in our sales. If printing your own labels for large quantities of items feels frustrating or time consuming, consider getting your FBA labels printed by OnlineLabels. Once all of your products are labeled with barcodes, you're ready to pack them up. OnlineLabels also provides a label size made specifically for FBA shipment boxes, OL2590, so you have one less thing to worry about. Our FBA inventory barcode & package shipping label sheet includes two labels measuring 3.5" x 5" and 6.75" x 4.5". Make sure there is only one scannable barcode on each product, this includes retail UPC/EAN barcodes. Cover or remove any old shipping labels if you're reusing packing boxes. Our blockout label material is perfect for covering up and making sure labels scan properly. Do not place your label on the seam of the box. If the label has to be cut in order to open the package, it may become unscannable. Getting your packages ready for shipping with Amazon can be pretty intimidating. It shouldn't have to be! Whether you decide to ship items yourself or have them fulfilled by Amazon, you can count on labels to improve the process. Follow the quick labeling tips in this article, and you'll be on your way to Amazon selling mastery. If you're looking for more tips or have some tips to share, check out our Amazon FBA forum post or our more in depth FBA FAQ article. If you find yourself shipping in larger volumes, you might also want to consider whether sheet labels vs. roll labels will work better.